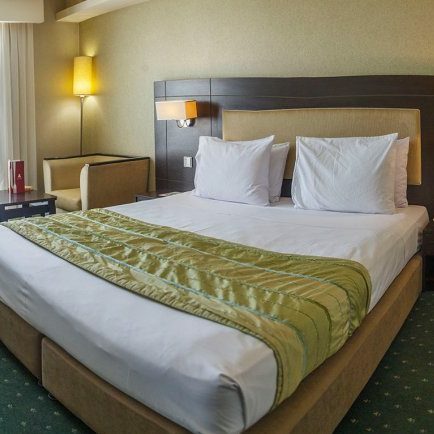 "Evin Hotel, Chamran Highway, Evin Intersection If you’re tired from all the pollution and commotions of Tehran, and you’re hoping for a breath of fresh air even in this city, Evin Hotel is an ideal choice. The hotel is close to Evin, Darakeh, Saadat Abad, and Velenjak, the “mountain” districts of Tehran. Baam Tehran and Darakeh Square are all close to the hotel, while Chamran Highway makes getting to different part of Tehran as well as the International Trade Fairs Center and the airport easy. Evin is one old hotels of Tehran, with experienced staff that make the hotel popular among tourists. Spacious rooms, poolside restaurant, shops, sports center, tennis court, and a café make Evin Hotel a great choice. "